Hi! If you are here to join in the 30 day challenge the information is below! I'm on day #9 which is to post a photo of someone who has gotten you through the most. That would have to be my husband. I've known him over half my life now (yes I'm only 20 haha). He is my Day #9! He put on a silly moustache to impress his daughters, no doubt. One of them snapped the photo! I used it as a Valentine's Day photo! Your turn to join in! Copy the schedule and put it on your blog! This will help you blog daily! Start at day one and link up your post, below! If you are just stopping in and you have one of these going, feel free to add your link!! Have a great day! I do have to admit that I love Butterscotch which is how this recipe came about. 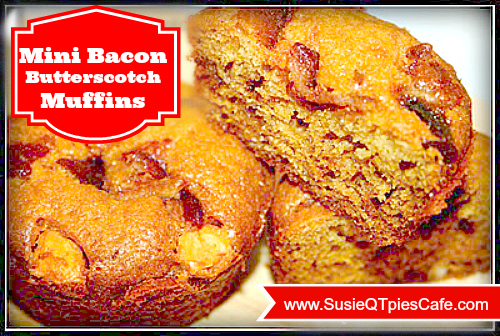 I added butterscotch chips to the basic amish friendship bread and tossed in bacon! The bacon adds a crunchy, sweet & salty taste that really makes these little muffins perfect breakfast recipe. From experience, that these Amish Friendship Bread muffins can be eaten at anytime of the day but I think that these would be fun to make for a breakfast meeting. A few people said "ewwww" when they heard that I was going to add bacon to my favorite FB recipe. Little did that know, I wasn't just going to toss in raw bacon! No way! I had to bake the bacon in brown sugar, first! I made these in regular and mini size! I also use a cute "Roundabout" cupcake sleeve to add some fun to these muffins. Enjoy! 3. Bake until sugar is dissolved. This takes about 10 minutes. Flip over and use rest of the brown sugar. 4. Bake until dissolved, again. Put bacon on a plate to get it out of the grease. Don't put it on paper towel because it will stick to it. Yes I know this from experience. Save the grease to make frosting, add to baked beans, etc. Either way, save it and use it for something yummy! 5. When cool, crumble bacon. I made my bacon the day before so it would be ready for baking day. I stored it in a zip lock baggie in the pantry. 1. Preheat your oven to 325°. 2. In a medium bowl, whisk together the starter, eggs, oil, milk, sugar, and vanilla extract until everything is well combined. 4. For the regular size muffins, grease the muffin tins and fill each one half way. You can use muffin liners but I like the crust that you get from baking the muffins in the tin without a liner. When they are cool, I then put them in muffin liners (optional). Bake them for 15-20 minutes. Check at 15 minutes. They are done when they are golden and toothpick will come out clean with some moisture. For the mini muffins, do the same as above. Only difference, these bake 10-12 minutes. I really love making the muffins. They cool quickly. I let them sit in the tin for 3-5 minutes and then transfer to a wire rack. Ok here is the other fun thing I did today. 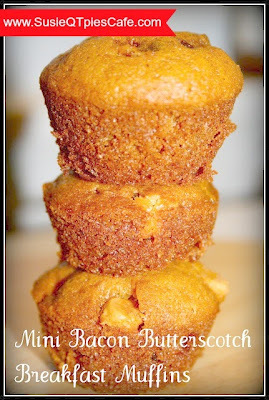 After baking my muffins, I used a Roundabouts® Cupcake Sleeve to turn these muffins into super FUN Burger mode! This is a great idea for any muffin/cupcake. They have over 80 other designs. Do you want more recipes? Click to find more tasty treats! To join in the challenge just start with Day 1. Copy the below schedule and put on your blog. Link up below so we can have fun visiting you! Feel free to use the silly kid button at the top of the page. 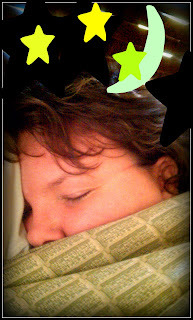 In your post, please include a link back to my post here so others can link up and have fun! I'm on day #8 and it is about a picture that makes you laugh. This photo is of Em when she was just 2 days young. Her dad had her down on the ground and was moving her legs like she was walking. I was totally cracking up which wasn't a good thing because I had in c-section staples. He did this with all of our girls up to to point where they were too heavy for him to do it. This is a super easy bread to make using the "Amish" Friendship bread starter recipe! This is a very easy variation on the basic sweet bread recipe. I love coconut milk and that is what is used in this recipe. I also used just 1/2 cup of coconut flour with 1 1/2 c. all purpose flour. I couldn't tell much of a difference using just that small amount of coconut flour from previous coconut bread bakings. Next time I make this batch I will move it up to 1 cup of coconut and 1 cup of all purpose. 2. In a medium bowl, whisk together the starter, eggs, oil, coconut milk, sugar, and vanilla extract until everything is well combined. Set aside. 3. In a large bowl, whisk together the flours, baking powder, baking soda, salt, and pudding mix. 4. Add the starter mixture to the flour mixture and gently stir until the batter just barely comes together. Gently stir in 1 cup of the shredded coconut. 5. Divide the batter evenly between two well greased loaf pans. Sprinkle some coconut in the bottom of the pan and sprinkle remaining 1/2 cup of coconut evenly over the top of the two loaves. 6. Place the pans in the oven and bake for 50-60 minutes, or until a toothpick inserted into the center of a bread comes out clean. Allow the breads to cool in their pans for 10 minutes before turning them out on a wire rack to cool. After 10 minutes you can eat a piece. *I did sprinkle some sugar on top of the coconut because I was using unsweetened coconut. Happy Day #7 of the Photo Challenge! To join, look below! Day #7 is to post a photo of your most treasured item. 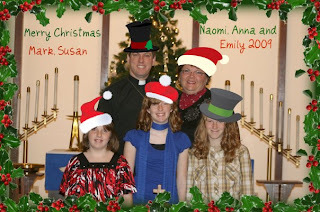 I have to say that would be my family. I've learned that treasures of this world can be gone in an instant and yes, that includes money, car, computer, shoes and people. So of those, my family is my treasure. The photo is from 2 years ago. I love it so that is the one I'm sharing! 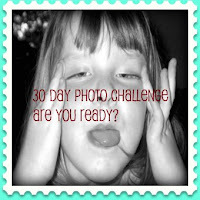 Happy Day #6 of my 30 Day Photo Challenge! To participate see below the next photo! For me, Day 6 is a picture of someone you would like to change places with for a day. I actually am very content and really do not care to be anything different. 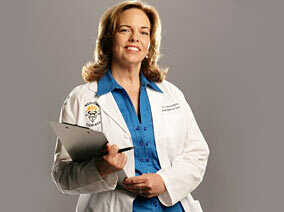 BUT to keep in the spirit of the challenge, I would love to be Dr. G. for a day (watch her on Discovery). She uses cutting-edge forensic science and technology to solve the mysteries of life and death, Dr. G: Medical Examiner explores the cases that come through a medical examiner's office in Florida. Dr. Jan Garavaglia leads the charge and explains how people can die suddenly and unexpectedly. Sometimes I wonder what life would have been like if I would have taken this path in college. I've always been fascinated with this science. I didn't take this path so now I live vicariously through the show and books written by others! Today is Day 5 and I'm suppose to picture my favorite memory. This is difficult because I've had so many. I'm just picking a random one. My girls are doing this, too, and they made a photo collage of some favorite memories! That was a great idea. This photo is of my 3 girls. Naomi (wearing her new favorite big bird sweatshirt) Anna (wearing her new favorite cookie monster sweatshirt) and Emily- well you can't see her so much. I'm very pregnant with her and the cookbook is blocking the view. She was born 6 weeks after this photo was taken. I love it, too, because my husband bought me The Joy of Cooking cookbook. The photo holds other memories, too. I no longer have the tree handmade heirloom tree skirt or the nativity set over my shoulder on the TV stand. So good memory to see them. 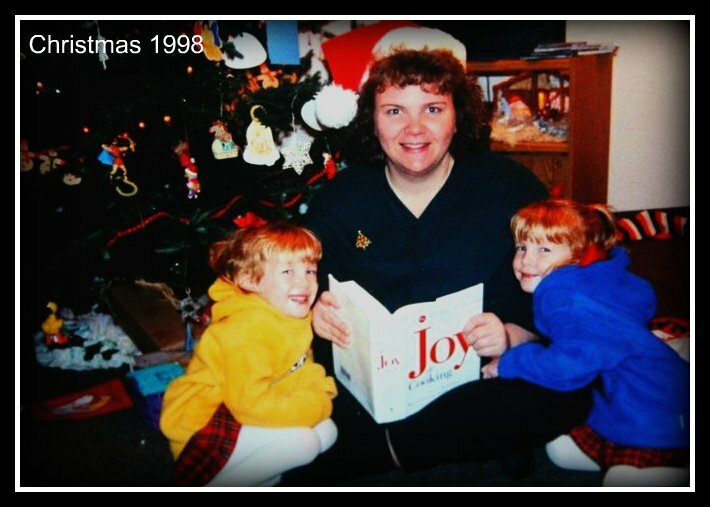 Sad memory to be reminded that they were left behind when Hurricane Katrina stopped in our home! We have a problem over here.....people love my various cake and cookie balls. This time I decided to make chocolate chip cookie dough into chocolate cover balls. I know, crazy, right? Someone passed along to me the idea and we figured out if you leave out the eggs in your recipe you won't have to worry about the raw egg issue. On a side note, it made me wonder how these cookies would turn out baked with no eggs. I'll try it soon. I also want to try this with other cookie dough like oatmeal and peanut butter! Cream sugar and butter until smooth. Add in vanilla and water and give it a quick mix. Pour in the flour and chocolate chips and stir until just mixed. IF you think your dough is a tad dry, add in a little more vanilla or water. After several tries this is the amount that worked for me. If you want even size balls, then use a small cookie scoop and put out on a tray that will fit in your fridge or freezer. You can drop the cookies from the scoop onto the try or you can roll them into a ball. Up to you. If I'm in a hurry to dip these in the chocolate (oh and leave some plain!) I will toss in the freezer for an hour. If you don't have freezer space then put in the fridge for and hour or so. About 20 min. before dipping, get your chocolate melted. I use a small electric melting pot which I think works best. IF you don't have that, then melt it in a glass bowl in your microwave. If you do this method then you only need to prepare it about 10 min. before you plan on dipping. *I haven't tried it yet but you could use MAGIC SHELL for ice cream on these. I don't use that because it is expensive BUT it would work. You could just use it to drizzle over the balls. I use the two toothpick method. I stick one toothpick in the ball, dip, place on aluminum foil tray and use the second toothpick to put the ball off of the toothpick. The top will look a tad messing so use one of the toothpicks, dipped in a little chocolate to smooth it over or add some sprinkles on the top to cover it up! These dry fast so work fast! It helps to have a helper but not necessary! Once dry they will no longer be shiny! Eat up! This batch made 50 balls and will differ depending on the size you use. Save some without chocolate! Link up any type of cake or cookie balls or pops! Thank you to all the bloggers who linked up last week! Follow the hostesses located in the first and second spots - Feeding Four and Scraps of Life Blog. If you want me to follow you back, please leave a comment letting me know that you are a new follower and leave a link to your blog. Tell me how you are following me and I will come over and follow back the same! All my ways to follow are on my right side bar- GFC, Facebook, Twitter and Networked Blogs. Create a new Friendly Wednesday blog post on your own blog and be sure to use the button provided on the side bar. Looking for an instant fix for your Oscar Night party entertainment? 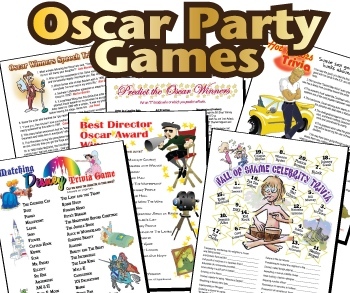 Check out this pack of 16 superb printable Oscar party games! You'll receive your games in minutes and can be playing right away. The product is instantly delivered by email. Download each game and print them at your leisure. There is no limit on the number of copies you can print of each game. How great is that? I'm a huge fan of their printables! They carry a wide variety of theme packs which is perfect and saves you time for that occasion! Most of the theme packs that I have seen include printables for adults and kids! I use to spend hours online trying to find printables for school or family parties! Not anymore! 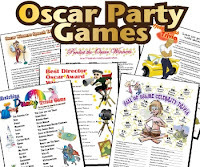 These theme party games are the way to go! *Meet Your Match Celebrity Acting Game where you pair up male and females with famous actor cards and they have to act out a scene together. This is fun because it is totally random as to which two actors will be put together. They have to stay in character and act off of what their partner is doing. *Predict the Oscar Winners is another great one! Just have your guest fill this out and then at the end see who hand the most correct! Maybe they deserve a trophy, too! *Scary Synopsis: Horror Movie Trivia is a great one for those who love scary movies! I knew most of the movies on this list and I'm not a huge horror movie watcher! So those of you who are movie fans will really love this theme pack! If you are an OSCAR JUNKIE like me, you will also love the pack because of all the fun trivia questions! You will surely do well and be the winner at any Oscar Party! What did you say? You stay home alone, in your Pj's, eating ice cream and watch the OSCARS alone? Not this year, get this party pack, invite over some movie junkies, make a few of the recipe suggestions and have fun! It only happens once a year! I am not a pro baker by any means but I've had several people ask me about baking and yeast lately. Some say that they never have any luck with yeast so that is why they don't bake! I say, don't be afraid, just do it! You only get better at something by trying and testing it over and over. There are two types of yeast that you see at the store. Regular Active Dry and Instant Yeast. The Instant yeas will have names like; Fast-Rising, Rapid-Rise, Quick Rise and or Bread Machine Yeast. Did you know that? Did you know that they are treated differently but you can use either one, for the most part. Have you seen them? So what is up with the Regular Active Dry yeast? This yeast has larger particles than the Instant and needs to "proof" before using with your recipe. This is the yeast that you have to add warm water, usually around 100-115 F. You can use an instant read thermometer for this. If the water is too cold or too hot it isn't going to bubble and froth! When it bubbles and gets frothy, you know that your yeast is active and ready to use. Most of the time I add 1 tsp of sugar with the water and yeast to help "feed it" and get it going. I'm sure it is because I'm impatient. If you don't want the sugar in whatever you are baking then skip it. I have heard that flour added will do the same thing but I have yet to try it. Here are some pictures of the Instant Active Dry Yeast. Have you seen them? Be aware that they look similar to the Active dry and are sold together. Make sure you know what your recipe is telling you to use. Can you see the difference? Only if you read and pay attention! Again, you can use either one but the Instant active dry yeast is a different strain of yeast and does not need to be proofed before adding to the dry ingredients. If you have a bread machine then this is the one you use. This yeast can be used instead of the Active Dry but just make sure you know which one you are using. If you yeast is not reacting when you add in the water to "proof" it, chances are you might have picked up one of the Instant, rapid rise yeast. Feel free to add any comments. Again, I'm not a professional. I'm a mom cook and this is my experience. I"m up to learn more so let me know if you have more to add! Click the top button on this post and join in on Tipping Point Tuesday blog hop! Just blog a tip! That simple! For my day #2 post you are to post a picture of the person you have been close with for the longest. 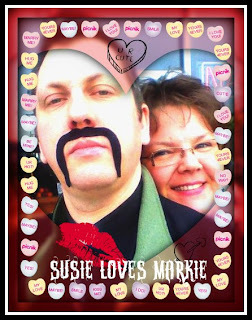 That would be my husband and best friend, Mark. We've known one another 21 years and married 18. I've known him over half my life. I love him! Here is a silly photo that was taken last month! THE 30 Day Challenge! Can you do it? You can start Day 1 anytime and link up below so I can stop in!